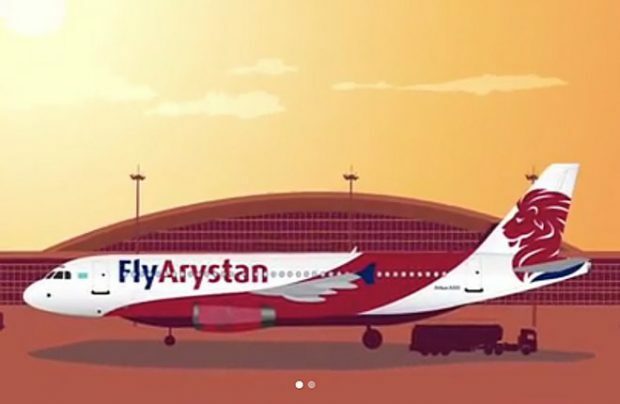 FlyArystan, Kazakhstan’s first low-cost carrier (LCC), has publicised details of its launch date and its inaugural destinations and, from March 29, has started selling tickets. Currently, the carrier’s official website reveals there are only two destinations from Almaty, which is considered the southern capital of the republic – to Taraz and Uralsk. Operating daily, FlyArystan will offer more than 130,000 seats on each of the routes annually. FlyArystan, which is to perform its first flight to the southern city of Taraz on May 1, is offering the cheapest one-way ticket for a 60-minute flight costing 4,999 tenge (US$13). Then, on May 2, the LCC is to inaugurate flights to Uralsk, which is the administrative centre of the west Kazakhstan region (its distance from Almaty is more than 2,500 km). One-way tickets for this flight start at 12,999 tenge (US$34). For comparison, according to the ticket reservation system of Air Astana, Kazakhstan’s national carrier and parent company of the LCC, a one-way ticket for the same direct flight in the ‘semi flex’ category for residents of the country costs 43,806 tenge (about US$115). “With only a month to go before the launch of our first services to Taraz and Uralsk, we are delighted at the immediate strong market response and look forward to welcoming our first customers in May,” said Tim Jordan, the new head of FlyArystan. Air Astana created the LCC in November 2018 in response to the desire of Kazakhstan’s then president Nursultan Nazarbayev and now Leader of the Nation to make air travel more affordable for the country’s population. Initially, FlyArystan, which is to use the parent airline’s Air Operator’s Certificate, but aims to apply for its own in the future, will primarily operate only domestic routes ahead of gradually expanding its geography to neighbouring countries. The LCC’s fleet initially consists of four 180-economy-seat Airbus A320s that are being transferred from Air Astana. By 2022, it is planned to increase the new airline’s fleet to 15 aircraft based at a number of Kazakhstan cities. “FlyArystan adds strength to what we can now call the Air Astana Group. It enables us to effectively compete in the growing low-cost travel segment in our country on better than equal terms with other airlines. FlyArystan gives us the opportunity to grow the overall market by taking customers from other forms of travel,” added Peter Foster, president and CEO of Air Astana. For FlyArystan to lawfully start operations, Kazakhstan’s legislation needs to be amended to facilitate the introduction of the classical low-cost model of air transportation such as to make it possible to sell non-refundable airfares. A source close to the airline has told ATO.ru that related amendments are currently being considered by the government of the republic.